The engine light is still on and Ken can't find the issue. 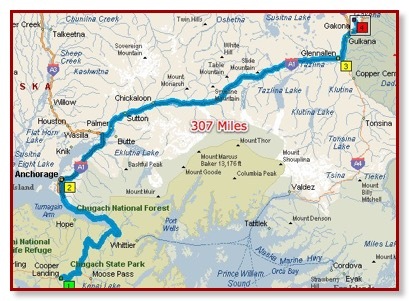 Although we would be willing to run up to Anchorage, Lithia Dodge cannot find time till Monday. We chose to see what would happen if we reprogrammed the computer back to "Stock" again. This appeared to solve the engine light issue for real. We drove about 50 miles to validate and we seem to be OK. The RV is shaping up inside and out. We are left with a few departure morning things to do. Guess we were more organized than we realized....or having a tough time realizing our time in Cooper Landing, AK is coming to an end. All we have to do is think of "kids", grandkids and friends at home and it makes it easier to leave our AK family and friends. Knowing we have made lifetime friends and that we will keep in touch is a comforting thought.....AND they all have invited us back. 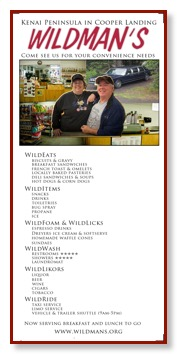 After going on another test drive to Moose Pass to validate the engine light (we were hoping to say another good bye to our friend Brett at the Moose Pass Lodge), we went to Wildman's for lunch and had our good-bye hotdogs. 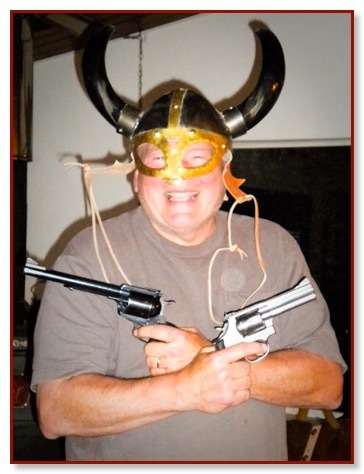 Lisa had hoped to take Maureen shooting but a trip to Soldotna with Denny to have the new logos put on the Wildman vehicles extended into a much longer trip than they planned. Guess that means a trip to FL or they have a trip to CO. We must work out the details. OBTW....nice logo!!! 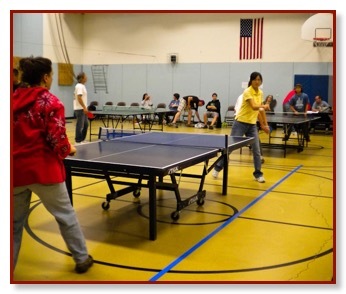 Hongye plays in the Table Tennis tournament tonight. We and the town are looking forward to the event! Hongye is a recent college graduate for Beijing University. 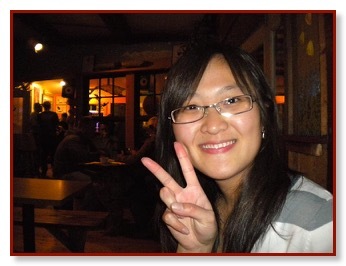 She is from a town in China called Harbin and as mentioned went to University in Beijing, China. After graduating, she took part in a work/travel program that Cheryle had access to for employees. We had 2 girls from China, Hongye who worked on the day shift with Maureen and Ko-ting who worked on the afternoon shift. Finally, Hongye and Maureen were able to have time to get together to spend it looking at each others photos. Since we were fortunate to have been able to visit Beijing, China, it was great fun looking at her pictures and actually recognizing many places in the photos. Unfortunately, we did not have our China photos with us.....maybe it will motivate us to get them on the web site! Through the photos we got to "meet' her parents and several of her close friends. After eating a quick bite of supper we all got ready for the tournament. 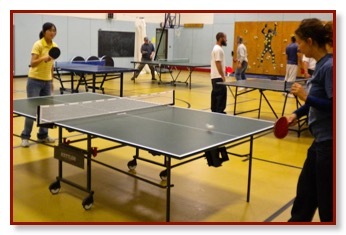 The evening for the tournement has arrived and in less than an hour the competition will commence. Our ever shy and humble Hongye was so embarrased when the lady who ran the tournament grabbed her arm and thrust it in the air and announced to the entire gymnasium that Hongye was the Woman's Champion. Hongye won the women's division with 3 quick victories against some very competent local entrants. After and hour and a half wait she played the men's winner for the overall championship. 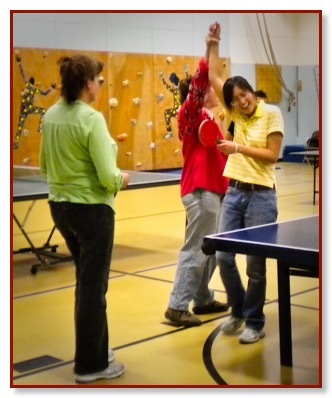 She then won 2 of 3 games to claim the victory.....actually surprised us when she lost the first game as we all knew she was being polite and held back! 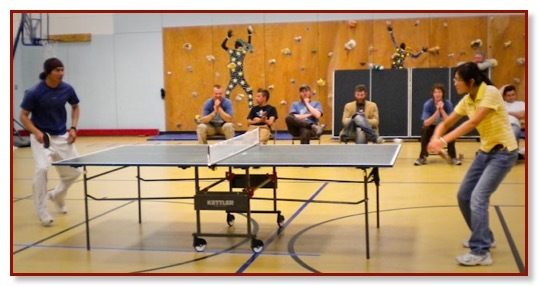 Since we all had never seen a real competitive match we wanted to see her in real action! George got to warm up with her and Maureen got to play a bit also and wished she could have played more! It was a shame when we found out the next night that the Kingfisher had a Table Tennis table and we could have used it at any time! Hongye's opponent was a fellow named Pho, who lives in AK in the summer and Beijing in the winter.....small world (and as Stephen Wright says.....but I would not want to paint it!). Competing for the overall championship. 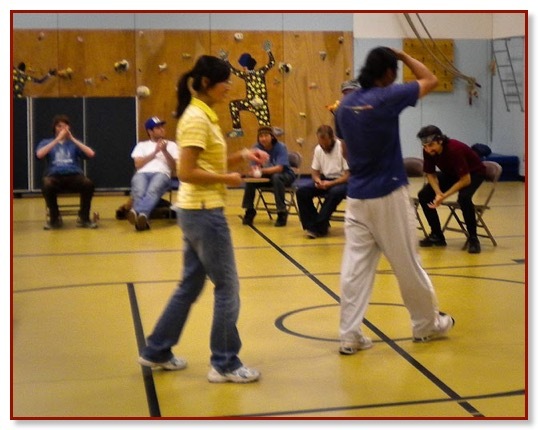 A good natured sport, Pho realizes he was lucky to play such a wonderful, skilled player. He is a skilled tennis player and teaches tennis in Beijing. Hongye came to our RV after the tournament and "Skyped" her dad. We sent some pics to him so he could share her win tonight. 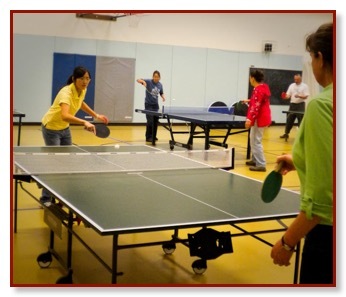 Her mom is gone till Oct 2 refereeing Table Tennis tournement matches around China. 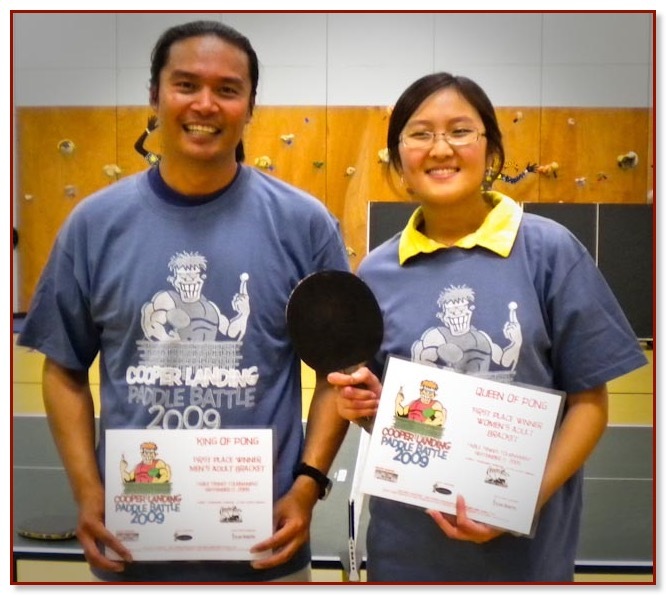 Now we know where her ability comes from as her mom is also a competitor and her parents encouraged her from a very young age to play Table Tennis. She won $40 for women's share, $50 gift certificate from Kingfisher (a wonderful local restaurant) and $50 for the overall championship.......well deserved! We decided to stay till Sat for more appropriate goodbyes!! We will join Hongye tomorrow at Kingfishers tomorrow night so she can enjoy her gift certificate and we can enjoy one more evening together. We are thrilled to have seen you play and pleased to have put off our departure until after the tournament. We got up early and did last minute organizing so that the inside of our "home" was ready to close up and leave. Our very tentative schedule was to leave at 9:30 and try to get to Tok. It is a 400 mile leg so it was a bit more aggressive than we typically like to do. We went down to the store to theT2 and visited with everyone. The shuttle crew was likely going to set the years' record today for the number of shuttles done in one day as they had 27 by 9:15. There was a twinge (a small one) of jealousy to be part of the record as George was part of the current record. It was tempting to volunteer to help make a few runs but as Pat would say...."....we are not feeling the love from George!" He resisted temptation and we headed back to the RV to hook it up to the truck and head out. It was quite difficult to say good-bye to everyone. Hongye, Jerry, Pat, Cheryle, Steph, Ken, Bill, Rudy, Andrew and even several customers said good bye to us. We got the nicest comments from the WM crew and we hope to meet up with them over the winter. Maureen pumped Propane for us for the last time. Yes - she can pump Propane and even make a skinny Raven white chocolate mocha! On our way back to the RV we took pics of the new WM logos on vehicles which look great. We got the RV closed, ready for travel and hooked hooked up in record time, which was amazing since we haven't done it for 6 months. We were justifiably impressed with ourselves. The spot we had chosen was a challenge to back into and we did it with relative ease.....prior to this we managed to put some "memories" on both the truck and the 5th wheel! As far as we were concerned, we had the best RV spot as we overlooked the store, Sterling Highway and could see everything around us with ease. We also saw the seasons come and go. 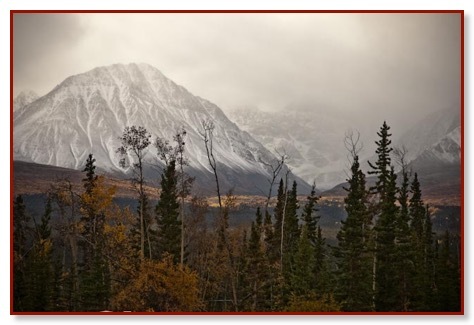 When we arrived the trees were bare and we actually could see Mount Cecil across the street. Just look at what Mother Nature can do in a week! And what 2 weeks of cold nights can bring.......fall is now upon Cooper Landing! ohn & Carrie came down and visited with us and, in typical Carrie style, continued to make things easy for us by disposing of our bag of trash and John and Carrie also took care of storing the platform they provided for us to use as a deck. During our stay they offered us so much to make our stay as awesome as it was (as did many others and more about them later).....among the many things they did for us is let Maureen have a a section in their greenhouse to satisfiy her gardening instincts. Although for several people in our neighorhood, including us, had a bad growing season, we had tomato plants about 6 feet tall and they did produce many tomatoes which we got to harvest and the cucumber plants produced several 14" cukes. Maureen got to make several batches of spaghetti sauce from the tomatoes and split the "fruits of their labor" with John and Carrie. (A few days later, while on the road she made a few batchs of pickles from the cukes! Amazing what you can do in such a small kitchen.) The collection of green tomatoes are now ripening nicely in the box in which they are stored......a new trick she has to share with John. 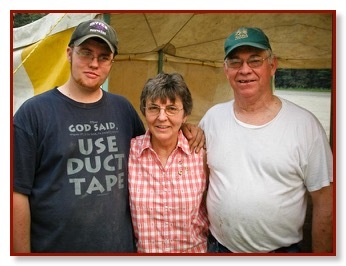 Meet Carrrie, John and Mikey (their grandson and pride and joy)......Carrie and John are stalwarts in the community and we cannot even begin to tell you what they do for Cooper Landing.....Mikey follows suit and when he is home he follows thier example and join in on work/activities for CL. Setting up for the 4th of July Fish Fry hosted by Carrie and John for the benefit of a Medical Clinic the people of CL are hoping to establish for the community. Currently, the closest clinic is in Soldotna which is 45min away or for more serious medical needs the people are required to go to Anchorage which is 2 hours north of Cooper Landing. Steve a customer who used to come in frequently heard we were leaving and took the time to walk over to say good bye as well! Actually, most people who were locals or "seasonals" came in every day and we got to know many on a first name basis, or by their purchases (i.e. 16oz carmel mocha), or by their cars that were shuttled i.e. Honda Pilot, blue with a key chain with a "fuzzy ball" on the key chain. Many became delightful friends over the summer.....although we will probably never see them again, it was a pleasure to share the time with them. We actually got on the road around 10:30 AM and things were looking good. The day was perfect and the scenery continued to amaze. 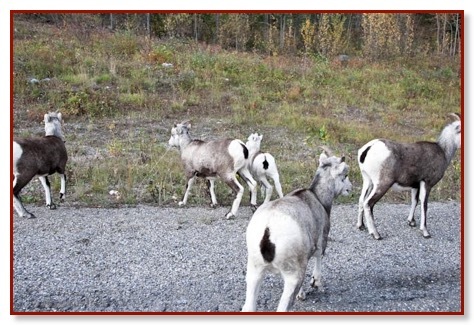 As we were approaching Anchorage, we stopped for a quick potty break and Maureen noticed that the passenger side outside dually appeared soft. We didn't have the where-withall to fix it while we were stpped on the highway, we opted to stop for fuel in Palmer and attack it then. We had no trouble going thru Anchorage and stopped at a Tesoro station to top off tank and pump up the tire. This was the first time that we had to deal with a dually and it turned out to be a bit of a challenge. After failing to get their air compressor at the gas station to work, we took out air compressor and generator to finish to task. The tire is supposed to be in the 70 psi range and it was down to 30 psi. We're convinced that the extension valve came loose because of all the dirt roads and bled off the air pressure. We'll validate this in the AM. It was a beautiful and uneventful drive from that point on with a few showers and accompanying rainbows. 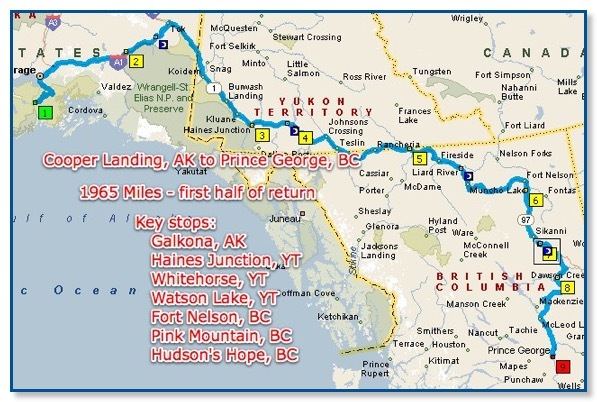 The tire issue put us back a little and we chose to stop in Gakona, AK, about 120 mi from our goal of Tok on the Tok Cutoff Highway. We got set up easily and quckly in an almost empty RV park. Nothing was broken!! However we have a bunch of Chinese vinegar all over the refridgerator and some on the floor. While George took Angus for a brief stroll, Maureen quickly cleaned up the minor mess, made a salad with her greenhouse goodies and heated up some homemade, delicious lasagna. We left the truck attached so that we could have an easy and quick departure in the AM. We actually left the truck attached to the RV when we set up last night to help us get away a bit quicker. We had a pleasant evening with no TV or phone connection (which is probably good as the roaming charges would be sooooo steep!) and a slow WiFi connection. Funny how our priorities have changed....the first amenity we look for is an Internet connection. With the Internet we have a connection to family, friends, news, e-mail......the world. We are self contained with the RV so if we do not have access to water or electricity it is not necessarily a hardship. 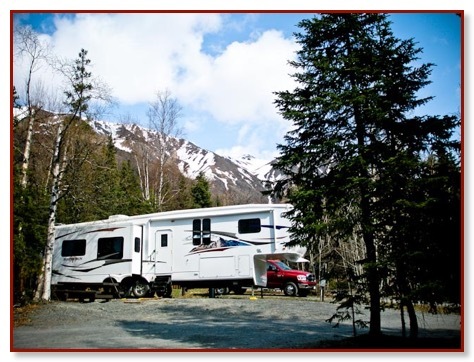 Traveling at the times we have...early spring and early fall.....many RV parks are closed or have limited facilities i.e. no water, no electricity, no sewer and then again many mega stores are very generous allowing campers to dry dock in they're parking lots...they know people will shop as a thank you for the hospitality. We got up to 30 degree temperatures. The sun was out and the day promised to be great. 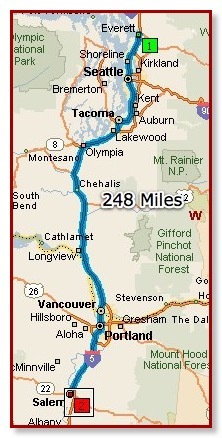 We were off and running by 9:30 with an outside chance of reaching Haines Junction, 410 miles away. The roads are quite a challenge at times. 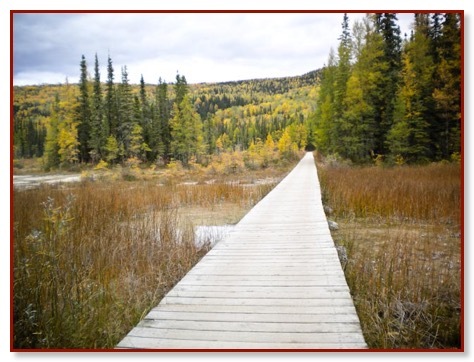 With ruts, patches of dirt road, and permafrost damage it is quite a challenge on the RV. As one might guess, everything in the RV must be in a secure place in a draw or cabinet. No matter how clever you think you are securing your belongings, the road has a way of shaking items loose. When we stopped for lunch we had a huge mess in the living room area as it seemed everything was jostled out of the cabinets. So, once again Maureen had to climb on the counter and slide down to the living room to clean up the disaster as you cannot open the slides which would make the project easier. Items can easily get behind one of the slides (on a 5th wheel you can have as many as 4 slides (and we do) to extend to provide more living area). If something rolls behind the frame of the slide and you are trying to extend it, it has the posibility of creating serious damage.....how do we know? We read about it....yes, that is it....we read about it! In traveling this part of the route both on our way to Alaska and back to Colorado, we have lost an end table, couch moving a foot out from the wall, damaged the "moulding", dinged cabinet doors, had the freezer contents greet us on the floor as we opened the RV door and empited the cabinets (both upper and lower) ever so many times. We have tried many "tricks" to contain the contents but it is a challenge to avoid the results of the RV twisting and jostling that occurs with the bumpy road. It is getting less and less but don't think it will ever be 100% consistently. 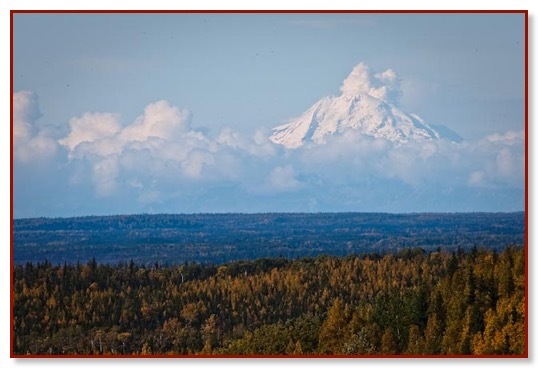 The view of Wrangell-St. Elias to our east along the Tok Cutoff was stellar. We stopped a few times for irresistible photo-ops. We also ran into a few showers along the way and also got our first look at Alaska's "Termination Dust". This is the frost and first snows that hit the mountains and disappear by the end of the day. This sight generally means the end (termination) of summer and, for the less hardy, it's time to head south before the big snow storms arrive. The greatest news is that Sirius Radio reappeared just in time for the NFL broadcasts. This allowed "us" the opportunity to listen to both the Broncos and the Bears. In Tok, we refueled and made a sharp turn southeast. This route, along the Alaska Highway, took us across the Canadian border (with a change from Alaska time to Pacific time) and then along the eastern edge of the Kluane National Park with its snow covered peaks. As we approached the border the road deteriorated and continued to be horribly unpleasant for around 100 miles. 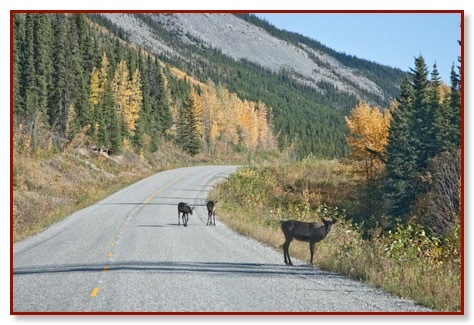 We sort of settled on stopping at Burwash Landing but we decided to push on to Haines Junction when we had navigated the worst of the highway and it was only 3 PM. This put us in to Kluane RV park at 7:45. We had tried to stay here on our trip to Alaska but the sites were too muddy. Maureen started supper and George did not notice that she had the electric frying pan in use and plugged in the heater for the living room and promptly blew a 30 amp fuse! Yes, another lesson learned (several times).....when you have a 30 amp connection you must be aware of the number of appliances in use. Fortunately, there was no one in the plot next to us so we moved the fully opened RV up 3 feet to allow the electric cord reach the recepticle. We traveled 410 miles today and entered the Pacific time zone. The Alaska time zone is 4 hours behind the east coast which can make for a challenge when planning phone calls. 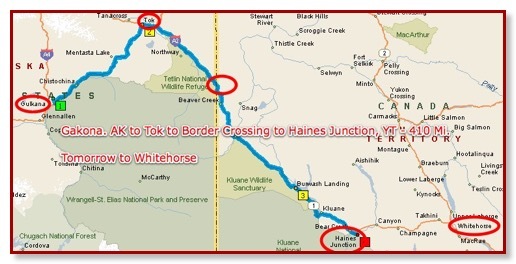 We chose to make an easy 97 mile drive from Hanes Junction to Whitehorse, Yukon. We did this because Whitehorse is a vibrant city as well as the Capital of the Yukon. The weather was cloudy with the temperatures finally reaching the low 50s when we arrived. 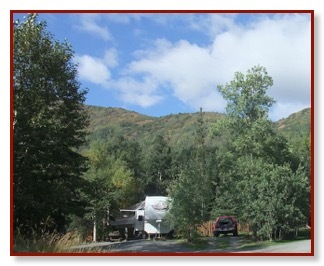 We stopped at a nice RV park (High Country RV Park) that was closed on our way up north. 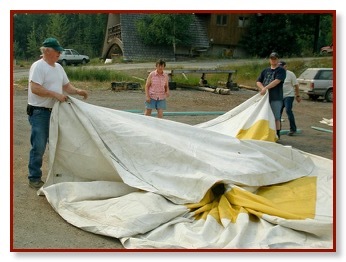 In fact they are in the process of preparing to close for the season on Thursday. Around the property they have many vehicles that are reminents of WWII which were used to build the Alaska (AlCan) Highway. The drive was very pleasant after the long and challenging drive yesterday. The road is a bit rough but no big issues. 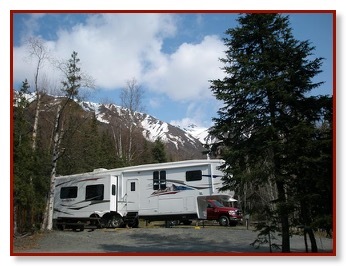 We left Haines Junction around 11 AM and arrived at the RV park at 2:30. This time we disconnected the truck so that we could drive downtown and enjoy the city. We returned to Sanchez Cantina for dinner. We had stopped there on our trip up because Geoffrey recommended it after enjoying it when he visited Whitehorse from Skagway. The owner and chef (a delightful Mexican woman) closes in December and returns to Mexico until until February. She brings back authentic ingredients to ensure authenticity. When taking our order, she greeted us with a big smie as she remembered us stopping on our way up to Alaska. She even remembered that Geoff had recommended that we stop and enjoy a truly authentic Mexican dinner and Margarita. 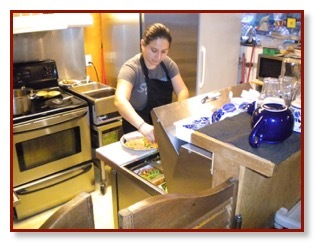 As you can see with the pic of her neice (her only help that day) working on an order, the kitchen is amazingly small. The picture reflects one half of the kitchen! It is not much bigger than we have in the RV and she and her neice produce some awesome dishes. We returned to relax and enjoy TV and WiFi for the evening. Maureen made pickles from the 2 14 inch cucumbers she grew in John and Carries greenhouse as well as well as 4 variets of macaroni and potato salad to have for lunches while traveing. Pretty good for such a small kitchen! No pictures, though. We’ll be headed to Watson Lake tomorrow. This is the town famous for the Sign Forest. Should be able to see a few more signs as they will not be buried under 5 feet of snow. We chose to stay an extra day here in Whitehorse. 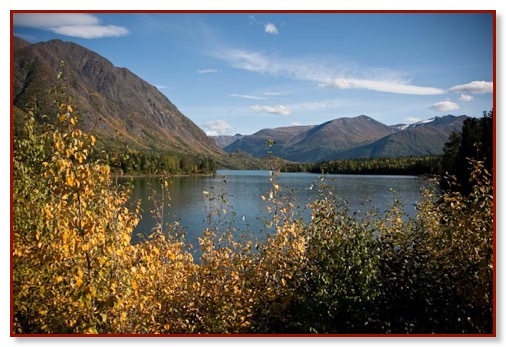 We are enjoying the city, the RV park we are going to work on the journal, prepare some travel food, do some mid trip reorganizing (that Tok to Haines junction leg was a bit harsh on our storage process) oh, and just relax. This is the third night we have camped next to a couple from Victoria, BC. They refurbish the inside of helicopters and have clients in Fort Collins and travel there frequently. Sounds like thy have nice bennies from the job as customers will come and pick them up and take them on a trip. 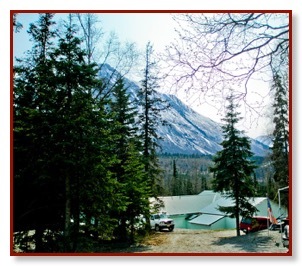 The just got back from a bear viewing trip...we had wanted to do that also as it sounded awesome but it was $700 per person!! 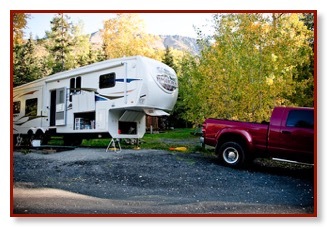 Stayed two nights here in Whitehorse at High Country RV park which will be closing in on Thursday for the season. 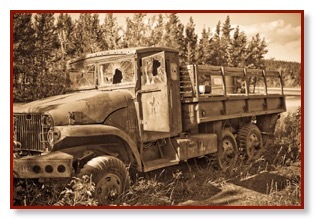 They had several vehicles on the property that were used in WWII to build the AlCan Highway which is now called the Alaska Highway. You see vehicles all along the route. Weather is delightful and we seem to be doing well on the blog catch-up as well as organizing all that got jumbled on this leg of the trip. We have seen lots of evidence of "Termination Dust" all around us but as we get closer the the lower 48 the trees are greener. It appears that we will get to enjoy the season changing all the way back to Colorado and as well as experiencing the Aspen going through its fall show. We got a 9 AM start this morning. This day would take us through Pink Mountain. This was the place that saved us on our way to Alaska as we were trying to survive a significant snow, sleet and wind storm that was raising havoc with travelers and totally exhausting and frightening us. Although they weren't totally open then, they were able to get us a spot with electricity (water was still frozen and no dump facility available yet) that allowed us to wait out the storm and to physically and mentally get ready to continue. 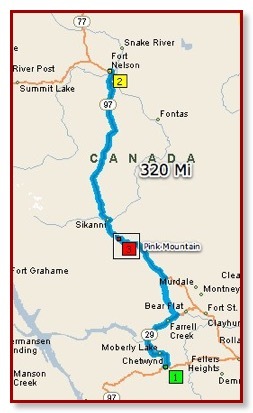 The two major events on this leg were that we stopped at Pink Mountain and we exited the Alaska Highway to the Peace Valley Route to Washington state. We checked out the RV Park to see it in a better light. It actually is very nice with sites in the woods and a comfortable, homey feeling. It was a bit disappointing not to see the same folks working as we wanted to thank them again for their hospitality. They were not at all prepared for campers but realized the danger of being on the road. As it turned out, a 5th wheel and another camper had slid off the road. Talk about a port in a storm..... After spending about 30 min wandering around the park, giving us and Angus a break, off we went. We did stop to eat at Shepherd's Inn to check out a place that turned us away on or way up. The food was substantial. The restaurant was run by a religious order which made it strange that they would not accommodate us when we were relatively desparate....seems those Shepherds were not watching out over their flock!! 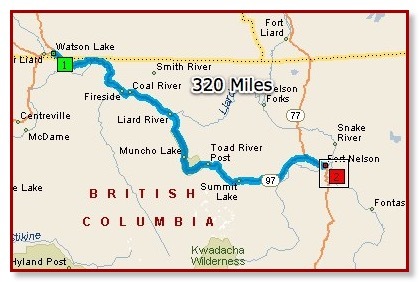 Just before we reached Fort St John, we diverted to route 29 which would take us on The Peace River Valley route. This took us on some significant climbs and decents that really challenged the Ram 3500 Dually but it never blinked. The scenery along the Peace River continued to amaze. We arrived in Cherwynd and the Westwind RV Park, a new, pleasant park. Statistic.....we have now gone 1,700 Miles and are still considerably above the latitude of Edmonton. 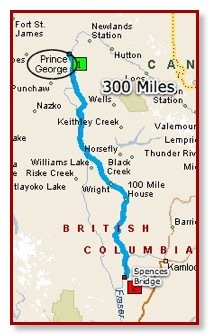 We are amazed at the length of BC. We left Prince George just after 9 AM. It was 30 degrees and the truck was covered with frost. The day was cloudless however. Prince George had been a pleasant break and we were ready to be a bit more aggressive. The road was ideal and the traffic sparce so it was a pleasant start. We are definitely getting into civilization. There were many more towns and a couple of good sized cities. But the most striking change was the appearance of many farms and ranches. 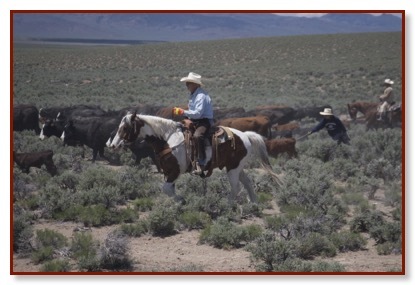 The sight of tilled fields and pastures filled with horse and cattle and waving grass of deep green was a nice change. We stopped for a break in Clinton, BC ti see if there are any Hillary memorials and then proceeded to Spences Bridge, a small town next to a small river. On the opposite bank, with no noice break, there is a very active rail bed. In the morning, we discovered that a 2nd set of tracks was on or side of the river and explained why we felt a vibrations and well as significant noise. 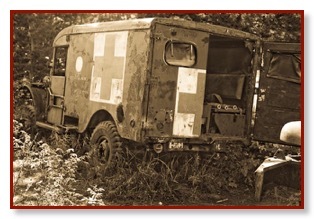 It reminds us of the time in 1965 that we camped 30 feet from the tracks in Medicine Hat, Alberta. Since this was in the plains of Canada, the trains were about a mile long and like to whistle hello to us. 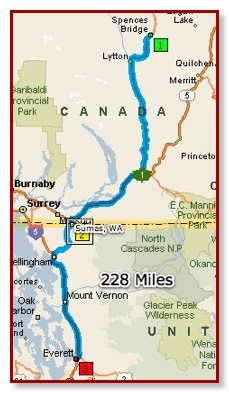 We are now 142 miles from the Washington border at a town called Sumas. It will have been 5 1/2 months since we crossed into Canada on our way to Alaska. Back to the US. We left Spences Bridge at 9:30 headed to Washington. The towns started appearing closer together and the traffic increased as we approached the border. 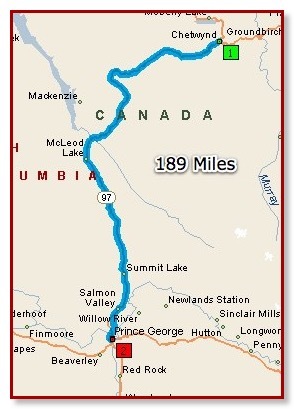 We merged onto Route 1, a six lane highway, and Sumas, WA was quickly approaching. It was pleasantly warm and sunny when we crossed into Washington and stopped in Sumas for a late and delicious lunch. Actually the crossing was very low key and pleasant. It was a far cry from the crossings we experienced in 2004. The entrance t the US both in Alaska and Washington were very confrontational. This time they were very relaxed. The agriculture that we saw as we progressed south on Route 5 was impressive and made us anxious to unhook and visit a fruit and vegetable stand. We never had the chance to do that but our intensions were strong. We continued to Everett, WA and found a fairly decent campground that was our first is a real city for 6 months. We unhooked and wandered around. It was a very pleasant stop that included a terrific Thai meal. Angus has been doing real well but we aren't able to give him the exercize that he (and we) should be doing. 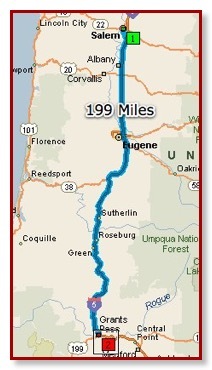 We plan on staying near Medford, OR for a couple of days and we will get caught up a bit. With a fairly short drive in front of us, we didn't depart from Salem until 11 AM. We filled a propane tank and were pleasantly surprised with propane costs. In Alaska, this fuel was about $3.50 per gallon. In Salem, it was around $2. The cost of living challenges In Alaska were primarily in energy. 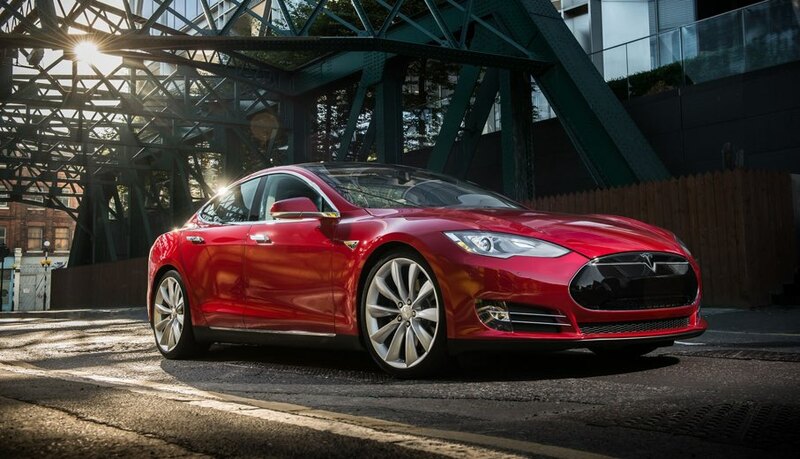 Fuel, especially diesel, was unfairly high. Despite the vast arctic oil fields, there are no refineries in Alaska. Also, there are some villages that are so remote that their only access to electricity is with a village generator which burns diesel. The drive proved to be as short as expected. We pulled into a pleasant site on the edge of hilly Grants Pass. We were 15 miles from Gold Hill, our real destination. We were here to meet a long lost cousin, Maureen Pheley. We've been corresponding with her for several months. 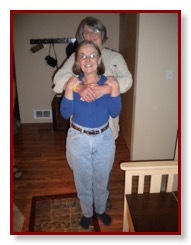 She and her family had lived several years in Palmer, AK and advised and shared our experiences. We met Kevin and Kemp in the middle of Gold Hill and followed them to their home in the middle of a beautiful farming area. We had a great meal and even better conversation that included some family tree exploration to determine where the Maureens converged. 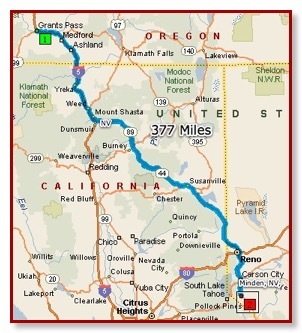 We departed Grants Pass for a fairly aggressive 377 mile drive to Minden, NV. The drive took us through some beautiful wilderness within sight of Mt. Shasta and other volcanic mountains. The last time we had seen Mt Shasta was in 1965. It is no less imposing. We continued through Susanville, the first city that we encountered from the when we got off I5 shortly after entering California. We stopped for a bit to eat and rest and then continued on to Nevada. It was here that we encountered the lowest diesel prices that we encountered on the entire journey. Minden is a town between Carson City (another state capital) and Gardnerville (home of the Palmers). We pulled into the Carson Valley Inn RV Resort around 5:30. The RV Resort was entirely paved, but very roomy. And it was only 3 miles from the Plamers. We got set up and relaxed for a little while before we drove over to see Peggy and Brian and the kids. It was home made pizza night so you can't beat that. We had a great evening of conversation and laughs. We returned to CVI (Carson Valley Inn) and turned in unusually early, pretty worn out from a long driving day. We drove to Reno to visit a Barnes & Noble and Trader Joes. It's been a couple of months since we have visited a B&N and ended up spending an hour wandering through the books and magazines just because we could. We went to the Palmer’s later that afternoon and had a great reunion. Brian was in the middle of cooking the Palmer Friday evening meal - homemade pizza. The household is a blast and reminds us of the Poiriers back in Dallas when we were uncertain which of the kids’ friends would be stopping by. We again spent the evening catching up and enjoying the camaraderie. Evening meals at the Palmers are always memorable and this one exceeded any expectations. Tonight Brian prepared Yorkshire Pudding. The center piece was a humongous high quality roast rib of beef. The Yorkshire pudding is actually popovers enhanced with dripping from the beef. Peggy was responsible for additional components of the meal including a baked pear dessert. Needless to say, the meal was spectacular. We actually spent the night at the Palmers and woke up to a snow shower. This was a bit of a surprise but only slightly disconcerting. We knew the snow would not last long. We returned to the Palmer’s house after a little R&R and a brief run through the casino. Maureen won $70 and felt like a winner. 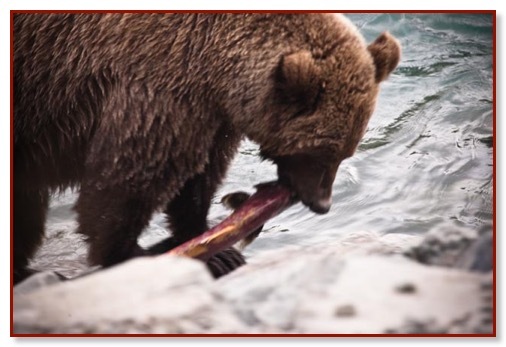 We brought some of our salmon and halibut for the evening meal. Brian had just gotten a smoker and proceeded to smoke the salmon. 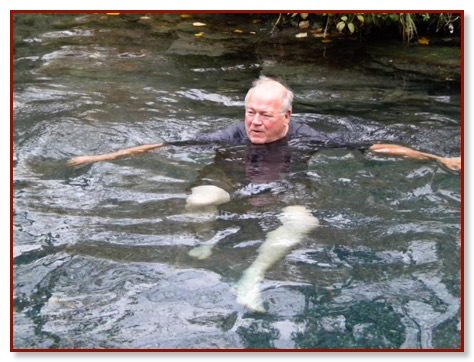 When it was done, he made a scrumptious smoked salmon dip. This disappeared by the time the halibut fish fry was done. We chose to stay another night at the Palmers. We were weren’t in a great hurry to get started. First we got on line to check the weather. We had intended to stay on I80 through Salt Lake to Rawlins, WY, We would turn south at Laramie on US 287 to Fort Collins and then get on I25 to Colorado Springs. Wunderground.com indicated that Rawlins and the Wyoming Rockies were due for some serious winter weather - both snow and temperatures. We opted to take a southern route for some reason. We also ran out to get propane and to top off our fuel before we hooked up. We finally got on the road at 10 AM. This day, we knew from previous experiences, would be much different that any driving that we’d done since we left Colorado in April. The drive on I80 from Elko to Wendover, NV was quite typical with frequent climbs and continually interesting terrain. When we drop out of NV at Wendover and the state line, 2 significant things happen. 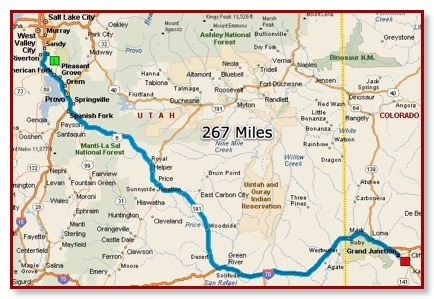 We cross into the Mountain Time Zone (we lose an hour) and the interstate becomes totally and straight for 51 mile and after a couple of slight steering adjustments, we arrive in the bustling city of Salt Lake. For that entire stretch, the elevation varies by no more that 30 feet. Additionally you drive through salt flats which aren’t real conducive to plant life and thus, any life whatsoever. 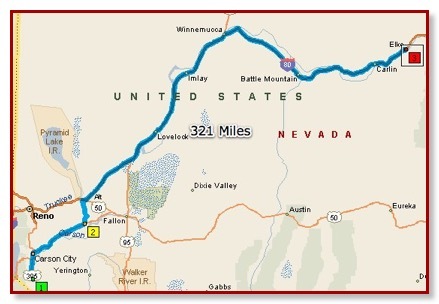 This drive does, in fact, take you by the world famous Bonneville Salt Flats. As desolate as this sounds, it actually isn’t as bad as you would expect. It is fascinating to see the wavering horizon and the vast whiteness. In Salt Lake, we got on to I15 and then exited in Draper and stopped at a busy, but pleasant RV park near an always fun Camping World. After getting set up, we went to Camping World and then to a very pleasant Italian restaurant. We’re about to start on the final 2 days of out great adventure.